The value of pipe #669 is 34 points. 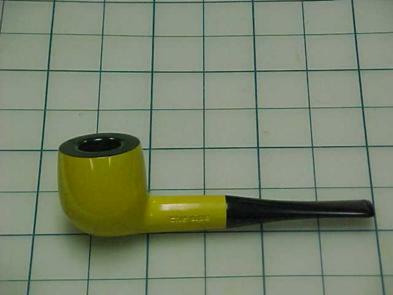 Carol Randlett (stella58) held an auction for this pipe. The listing photo was unclear as to whether it was a new or old Federal Gold, so I took a chance. Sadly, I lost that bet when it turned out to be a "tweenie" shade but closer to old than new. So, even though it is in better condition than the one in the collection, it joins the Pipes for Sale. Trent Rudot, a millwright who makes pipe carving tools, decided to give it a try.